The American Egg Board (AEB) may have violated federal laws by using public funds to try to obstruct Hampton Creek from selling its eggless mayonnaise alternative “Just Mayo.” The USDA has now opened an investigation. Hampton Creek accuses the AEB of conspiring to thwart sales efforts in Whole Foods grocery stores and has obtained a series of emails under the Freedom of Information Act (FOIA) showing some pretty damning email exchanges within AEB’s leadership. 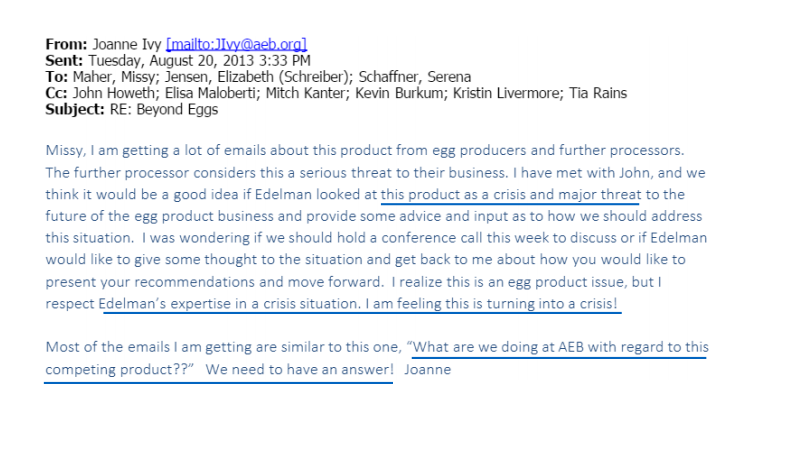 AEB CEO Joanne Ivy sent messages calling the startup “a crisis and a major threat” to Edelman, AEB’s PR firm. The messages also ask the PR firm for help in handling what AEB perceived as a crisis situation, according to the obtained emails. The conversations span a couple of years, including before Hampton Creek had launched its first product. AEB apparently tried to call Whole Foods via an independent contractor to keep Hampton Creek’s product from selling before it hit shelves in 2014. “Imagine the PR buzz that can be created if Whole Foods was on our side,” director of marketing Elisa Maloberti gleefully wrote another board member in December 2013. Whole Foods went ahead with “Just Mayo” anyway. Hampton Creek hasn’t had good press lately and this seems like the kind of “David vs Goliath” story it would need at this moment. Many, including TechCrunch, have questioned the data and processes inside the startup. The FDA recently came down on Hampton Creek for misbranding its “Just Mayo” product as heart healthy and cholesterol free when it was not. But here’s where it gets sticky – the AEB may have been the ones to tip off the FDA as well as work with Unilever, which leveled (and lost) a lawsuit against Hampton Creek over the labeling of its product as “mayo” when it was not by definition a mayonnaise. One of the internal emails from AEB discusses challenging Hampton Creek’s “Just Mayo” label with the FDA; another shows AEB conspiring to help Unilever. Hampton Creek founder Josh Tetrick went to the Guardian with those emails and called for an investigation into the USDA, which oversees the AEB. Utah senator Mike Lee saw the reports and tapped USDA secretary Tom Vilsack for an investigation, as well. “It has come to my attention that the American Egg Board may have engaged in anti-competitive practices and violated federal law by directing a coordinated campaign to reduce marketplace demand for ‘Just Mayo,’ a popular vegan mayonnaise alternative produced by Hampton Creek, a Silicon Valley-based food company,” Lee wrote to Vilsack. By law, USDA is charged with providing oversight to all Research and Promotion programs, including the American Egg Board. USDA’s Agricultural Marketing Service (AMS) carries out the day-to-day oversight of boards, ensuring fiscal accountability, program integrity, and fair treatment of participating stakeholders. While AMS approves a wealth of board materials and communications, AMS does not pre-approve the content of every email of a board member or board staff member, nor are these individuals USDA employees. AMS is conducting a thorough administrative review of issues involving the American Egg Board. This involves a substantial amount of material, and while AMS expects to complete the review in an expeditious manner, a complete review will take some time. AMS will not comment on personnel matters involving the Board. The emails definitely raise some eyebrows. One even jokes about putting “a hit” on Tetrick. AEB’s CEO has even stepped down since the investigation. Ivy was slated to leave her post at the end of this year, but the USDA has confirmed she’s taken an early retirement. Was it because of the USDA investigation? AEB would not comment on that. Instead, it referred all questions back to the USDA. The AEB’s emails are now up for review with the USDA and we should know more at a later time, according to Jones. You can read those FOIA-obtained emails in full by clicking here.